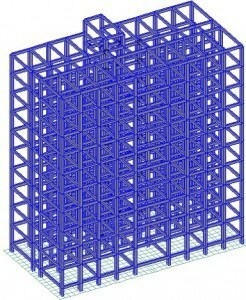 Three-dimensional structure is modeled for the analysis utilizing the STAAD Pro software. The plan dimensions of the building are 34.92 m x 16.85 m.
The Structure has 10 (G+9) stories with height of 3.66 m each. The raft is modeled with the structure. The total area of the raft is divided into finite number of plates. The soil under the raft slab is represented by a set of springs for which the spring constants k, adjusted to reflect the corresponding soil type. Approximately 1.0m x 1.0m plates are used. Thickness is taken as 600mm. The magnitude of minimum imposed load which has to be considered for the structural safety is provided in IS: 875 -1987 (part II). Here imposed load of intensity 3kN/m2 and 4kN/m2 have been taken as per the code and same is applied in all floors. On the roof it is taken as 1.5kN/m2. 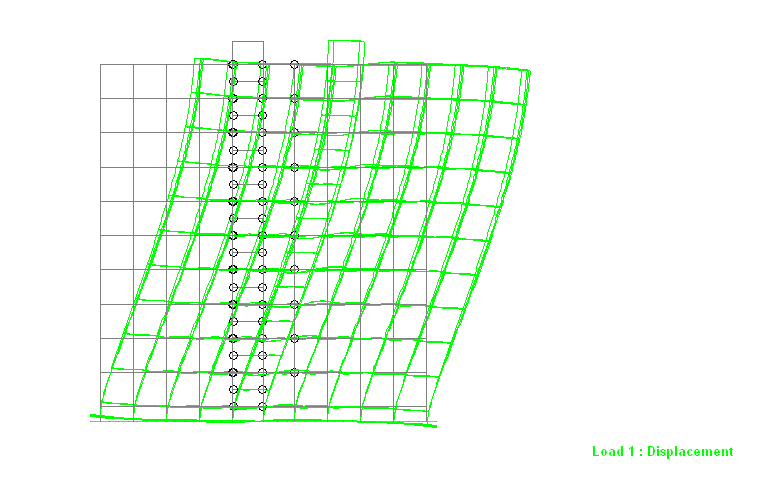 Calculation of base shear is carried out for structure located in seismic zone IV. I = 1.0 considering the structure is of general category. It has been observed that the stiff stratum at the base does not change the design forces significantly. The bending moments at the base of the columns under gravity loadings show a greater increase for soft soils as compared to the medium and soft soil. As the stiffness of the soil strata increased, structure behavior became closer to that observed for rigid supports. Abrupt change in bending moments at the base for foundations on softer soils. Generally this portion of the structure is not given consideration in most of the practical designs which are based on the assumption of rigid support system. For seismic forces, magnitude of bending moments in the columns and beams of the structure increase with the increase in modulus of subgrade reaction. The relative displacements between successive floors are less for structure on soft soils. For soft soils very significant increase in displacements of the structure can occur when subjected to lateral forces due to earthquake. For EQX forces deflection at the top floor was 10 to 12% more for structure supported on soft soils than that observed for the case of fixed supports. More BM in members due to differential settlement in soft soils. The softer the soil, the more the differential settlement. 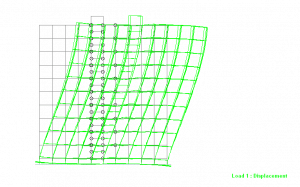 This differential settlement resulted in an increase in bending moments of raft slab. As the value of modulus of subgrade reaction decreases the differential settlements increase leading to an increase in both the hogging and sagging bending moments. The hogging moments produce tension at the top and can cause the foundation to loose contact with soil. Hence due consideration must be given to the elastic nature of soil in design. The soil structure interaction must be considered in the design of structures. At the design stage, specific effort must be made to find the realistic value of modulus of subgrade reaction depending on the type of soil, so that we can get the exact design forces for optimum design solution.